I am not a famous poker player, in fact I don’t play poker at all. But if I were a famous poker player, I might say something quotable like – "In poker there is no no such thing as a bad hand, only bad players". However, I am a woodworker, so my famous quote will have to be – "In woodworking there is no such thing as bad wood, only bad woodworkers". 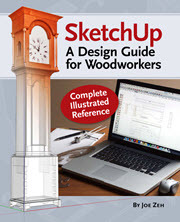 Now I don’t mean to offend anyone, so in this politically correct world I should probably revise my yet to be famous quote to "In woodworking there is no such thing as bad wood, only budding woodworkers". Ahhhh! With that settled I can now write this article. Hardwood is rather expensive, generally costing from $4.00 a bf to $10.00 a bf, and averaging around $6.00 a bf. I don’t like paying that premium, I much prefer to spend money on tools. So I have a strategy that works for me – and maybe for you too. If you live in the country there are bound to be local sawmills, often one person hobby sawmills. Find out where they are and cultivate a relationship with the owners. I guarantee you, if you spend some time at it, you can get the best hardwoods for about $2 a bf on average. 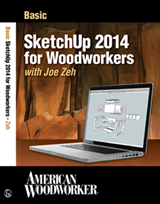 Be ready to help someone cut wood. They will pay you in wood. Keep an ear open for the little old lady who wants that black walnut tree cut down in her front yard (see my website for just such an opportunity – Wood Sources). She probably doesn’t know or care about its value; she just wants it gone before it falls on her house. The picture at left is of black walnut "firewood" I rescued. Be ready to trade a custom piece for a several hundred board feet of lumber, or help someone out with a built-in in exchange for lumber. Country folk know how to barter. Much of what they have they obtain through bartering. 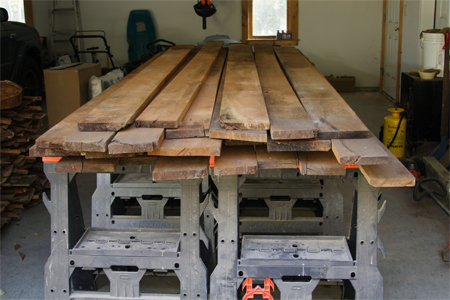 Join in the bartering and get your favorite hardwood cheap. If you live in the suburbs or cities, be prepared to drive an hour or two. If you buy 50 – 100 bf you are saving $200 – $400 and that will certainly pay for the gas even at $5.00 a gallon. Plan ahead. When you buy rough lumber you may have to dry it, or at least let it acclimate to your shop conditions. Don’t expect to purchase it on a Friday evening to begin building on a Saturday. Now, this strategy works only if you work at it, AND you are willing to work with the lumber you are can get your hands on – or should I say "Play The Hand You’re Dealt" which is the title of this article. When you deal with hobbyist sawyers or private people you can’t expect to get quality-level-one lumber. Often these people don’t know how to treat the ends of green lumber to keep them from splitting. Seldom do they know what thickness to cut green lumber to end up with 4/4 dried material. 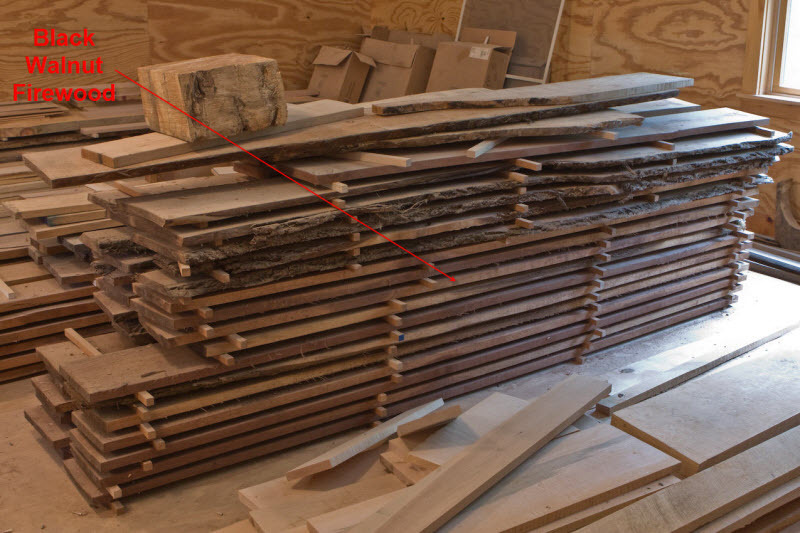 Many don’t know the difference between plainsawn and quartersawn. You have to look beyond these problems and see the wood for it’s potential. 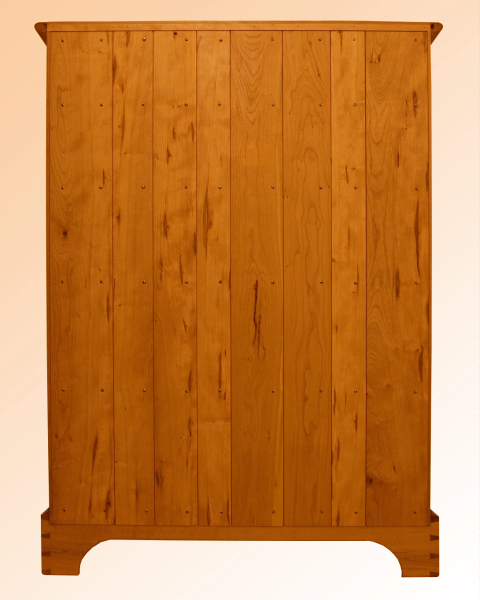 My brother and sister-in-law asked me to build them some maple cabinets for their laundry room a few years back. I didn’t have maple in my stock at the time so it would have cost about $6.00 a bf to purchase. I told them I could do it with cherry for about $2.00 a bf. They jumped at the opportunity. I started with the wood shown above right. Notice the split ends. This would be low quality cherry if purchased from a retailer. 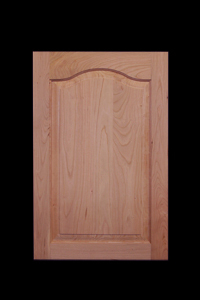 After careful selection and preparation I was able to get sufficient cherry to produce the face frames and doors for the cabinets. See a completed door at left, shown before finishing is applied. I am always on the lookout for "firewood" to rescue. The second floor of my 30′ x 30′ shop is cluttered with piles of assorted wood. Some of it looks almost unusable. Take a look at the picture at right. You will see a pile of tiger maple in the back corner. It is twisted, warped, bowed and generally unattractive. Worse yet look at the pile of cherry in front of it with pitch pockets and bark on the edges. What could possibly be the use for that? I built a Shaker inspired "Cherry Chest of Drawers" for my woman friend some time back. You can find the finished piece in my Gallery. I needed wood for the ship lapped back. Since the back would never be seen, the wood merely needed to be structurally sound. The pieces could be random width but all the same length. 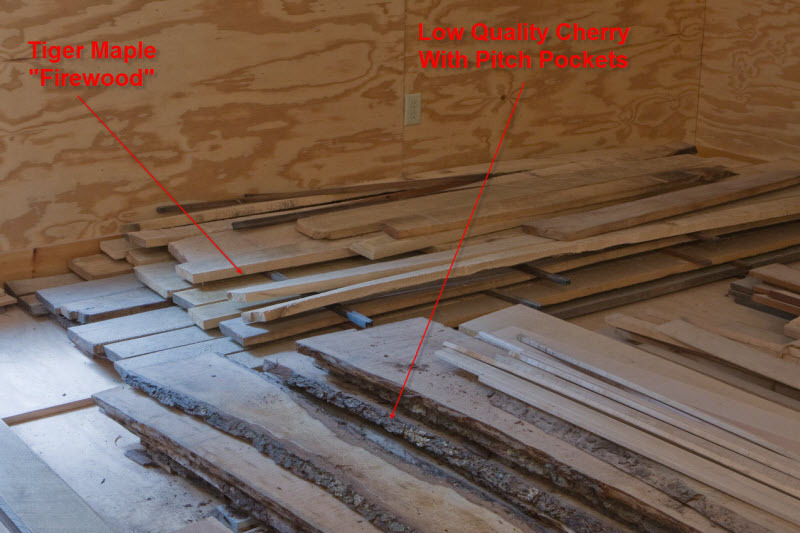 The cherry in the pile shown above right fit the bill perfectly as shown left. Notice the pitch pockets. They actually add something to the back. T he tiger maple "firewood" shown above right I acquired through my brother-in-law who worked for a sawyer who supplied wood for pallet construction. I got this 200 bf pile of tiger maple for $1.50 per bf (the pile was larger when first stickered). I have been waiting a year for it to dry so I could see what it would look like in a finished piece. Well, my most recently completed project is a 30" T x 30" W x 72" L table for my office. I built it out of four species of wood. Cherry was used for the table legs and aprons. The drawer bottom was birch, its sides and back tiger maple, its front blistered maple and the drawer opening has a beading of black walnut. The top, shown right, is tiger maple, the very same tiger maple shown in the picture above. This rough cut tiger maple was fortunately cut to 1 1/8" when wet and dried to about 1 1/16". Because it was twisted, warped and bowed, I had to plane it very carefully and with a watchful eye to be sure I got 3/4" finished thickness out of it. In fact, one board didn’t quite make it, but I used it anyway, placing it bad side down. 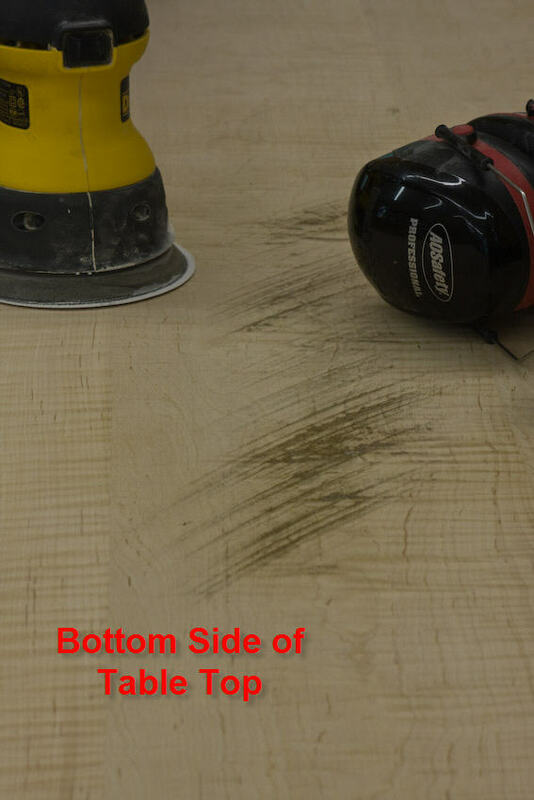 The glued-up table bottom is shown left with this "flaw". It actually adds something to the piece. Two hundred years from now an antique dealer will point it out to a customer as evidence of a hand made piece. You can see the finished piece titled "Office Table" on my Gallery page. The moral of this story is, don’t pay high prices for wood; buy tools instead. You can get all the "quality" hardwood you will need if you just keep your eye open for firewood, cultivate local sources and are willing to barter. The selection and preparation will take a little longer and you will have to train your eye to "see" the opportunities in lower quality rough lumber, but it is well worth the effort. And it is an added thrill, at the end of a project, to look back at pictures of the starting material. So keep a photo log of your stock and work. It adds to the "Joy of Woodworking". 1:08 pm, 17 July, 2008 р. 2:40 pm, 17 July, 2008 р.
I must admit that for years I did the same thing until my brother-in-law showed me the error of my ways. His name is Winter and he worked for many years as a sawyer and wood grader. He knows more about wood than anyone I have ever met, read or heard about – he is amazing – he can look at a cherry log and tell you if it is curly. Winter has also introduced me to a lot of local gentleman loggers and sawyers. So yes, I am fortunate. But anyone can develop these sources if they just look and ask. Look carefully at what you are cutting for the fireplace and good luck. 9:25 am, 7 August, 2008 р.
I’m too old to be helping with felling and splitting trees! However, I’d be happy to build a custom table or something in exchange for some hardwwod. That said, and sadly so, the last of the small sawmills has been abandoned in this area. The bigger ones won’t touch anything but red oak and poplar. But I admire your hardwood holdings and congratulate your success in finding and building with some very nice hardwood! 9:59 am, 7 August, 2008 р. Where do you live? 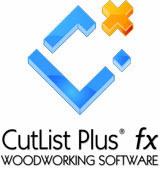 Have you tried looking on the Wood Finder website ( http://www.woodfinder.com/ )?